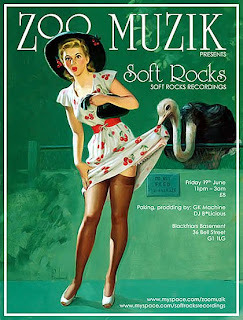 Following the club launch in May, ZooMuzik welcomes Chris G from Brighton collective Soft Rocks to the basement at Blackfriars in Glasgow, for a disco- fuelled DJ set on Friday 19th June. Four-piece Brighton collective Soft Rocks are responsible for setting the music and club-land scenes ablaze with their edits, productions and DJ sets. As well as producing and DJing, they’re heavy-duty record collectors who have gained a reputation for discovering many lost classics. Their sets embrace a variety of styles from rock, house, Afro, boogie, disco, cosmic, Balearic, and Italo – if it’s heavyweight music you want– Soft Rocks are out there on their own. 2008 saw Soft Rocks put out releases on Eskimo, Lo Recordings, and their own label Soft Rocks Recordings – with a fantastic remix for the mighty MGMT, CRUE-L in Japan, and Black Pepper in Italy. Having clocked up performances at many of the leading festivals last year including The Big Chill, Bestival, Connect and the Garden Zadar, and with another five releases scheduled for 2009, it's understandable that the music press have been touting them as new leaders of the leftfield disco scene.